REDDING, Calif. - Simpson University hosted more than 500 North State community, business and civic leaders during its 14th annual Business Leadership Luncheon on Sept. 1. The event was sponsored by Redding Bank of Commerce. Author, speaker and trainer Dr. Paul White spoke about “Detoxifying Your Work Environment with Authentic Appreciation.” Sharing from extensive research, he talked about why employee appreciation is valuable, why most employee recognition programs don’t work, and different ways to personalize appreciation in the workplace. “People feel valued if appreciation is communicated regularly and expressed in the ‘language’ and actions most important to the recipient,” he noted. Dr. White has written articles for and been interviewed by Bloomberg’s Business Week, CNN/Fortune.com, Entrepreneur.com, Fast Company, FoxBusiness.com, Huffington Post Live, U.S. News and World Report, and Yahoo! Finance. He has coauthored three books, including The 5 Languages of Appreciation in the Workplace, written with Dr. Gary Chapman (author of the No. 1 New York Times bestseller, The 5 Love Languages). Learn more about Dr. White’s research and resources at appreciationatwork.com. Luncheon guests ate a meal prepared by Chef Cal DeMercurio, the university’s new director of dining services. Each year Simpson University invites a guest speaker to address community leaders on a business-related topic. 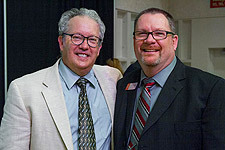 Past guests have included Dr. Tim Elmore, who spoke last year about Generation ‘iY,’ and Pat Williams, senior vice president of the NBA’s Orlando Magic, who spoke at the 10th annual luncheon in 2011. Top: The 14th annual Business Leadership Luncheon drew a sold-out crowd at Simpson University's Heritage Student Life Center.